UP Staff Nurse Joining Letter 2019 On Saturday 1 September 2018 Uttar Pradesh Lok Sewa Ayog Published Result of UP Staff Nurse. Total 2388 Staff Nurse has been selected to get the Staff Nurse Joining Letter in various Health Department of Uttar Pradesh. 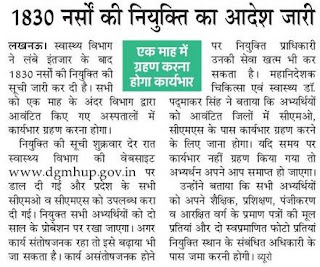 UP Government has invited 4388 Staff Nurse Recruitment and in that case only 2388 able to qualify for Staff Nurse Appointment letter. Supreme Court Law Clerk Syllabus 2019 SCI Solved Question Papers of Supreme Court of India LAW CLERK Exam Analysis OF sci clerk syllabus 2019. Supreme Court Clerk Previous Years Papers. NFL UP Account Assistant Recruitment 2019 Apply online For 52 AO W3 Level Vacancy in National Fertilizers Department Uttar Pradesh. Those candidates who are interested to follow the National Fertilizer Accountant Assistant Recruitment rules and regulation. You are welcome here.